Henrik Henricksen (1880-1952), nicknamed "Tiger-Henricksen," was, in the first half of the twentieth century, one of the greatest cat trainers of the Hagenbeck school—although his spectacular style was markedly different from that of other German cat trainers of that school. His large group of tigers (up to sixteen at times) included a giant and quite dangerous Siberian tiger named Cæsar, which he presented alone at the end of his act. His was a remarkable presentation which won him his circus title, "The Tiger King." 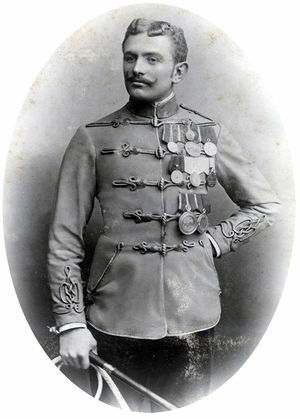 He was born Hans Heinrich Lühr in Hamburg, Germany, on January 21, 1880. His father was a carpenter and his mother, who was French-born, a piano teacher. Very early, Hans showed a great interest in animals and, as a kid, enjoyed training mice and rats. At the age of twelve he asked the well-known cat trainer(English/American) An trainer or presenter of wild cats such as tigers, lions, leopards, etc. Julius Seeth to take him as an apprentice; a little nonplussed, Seeth responded that he would consider it once Lühr had finished school! Hans made his performing debut with Hagenbeck’s bear act in 1899 at Zirkus Bauer, billed as Henriksen—a Nordic-sounding stage name adapted from his middle name, Heinrich. (It will be later spelled Henricksen, and his first name would be Heinrich, Henrik, or Henry, according to various advertizings.) The following year, he appeared at the Exposition Universelle (World Fair) in Paris, where Hagenbeck’s spectacular group of polar bears was a huge success. Henricksen and the Hagenbeck bears then toured all over Europe: Circus Corty-Althoff in 1901 and 1902, Circus Krembser 1902, Circus Salamonsky in Moscow in 1903, Cirque Devigne in Odessa and Circus Beketow at the Cirkusbygningen of Copenhagen in 1904. Henricksen was employed on a fixed salary, and it was the owner of the act, Wilhelm Hagenbeck, who got the profits of what was a very successful attraction(Russian) A circus act that can occupy up to the entire second half of a circus performance.. So Henricksen sought better financial opportunities and, after his 1904 engagement with Beketow, he left Hagenbeck to work for Frank Bostock (1866-1912), whose famous menagerie and animal exhibitions had taken residence from 1902 to 1904 at the Hippodrome de la Place Clichy in Paris—renamed Hippodrome Bostock for the occasion. 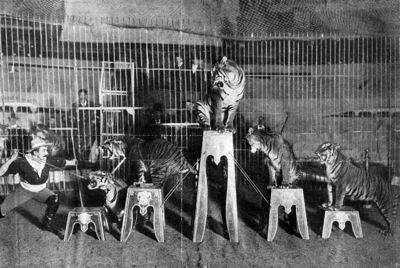 Amidst his vast menagerie, Bostock had five tigers, but he had promises of lucrative contracts if he could produce a large tiger act, which was quite unusual then. So, Bostock went on to a shopping spree, buying all the tigers available in European menageries. He ended with a total of eighteen tigers, including a huge Siberian named Tammany, a dangerous individual with a bad rap sheet; Tammany didn’t like the company of other tigers, which he had already made clear by killing his brother! Henricksen was put in charge of this imposing group. It was not an easy task: It soon became evident that Tammany had to be presented separately, at the end of the act; furthermore, not all animals could be successfully included in the presentation. After two months of hard work, trials and errors, the act was ready with a group of fourteen animals, plus the formidable Tammany, who fought alone with his trainer as a final after-piece. 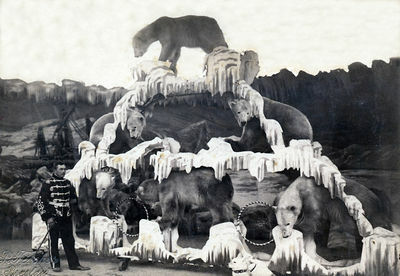 In 1905, Henricksen went on tour with Bostock to the Americas: Buenos Aires, San Francisco, and New York, where Bostock installed his menagerie at Coney Island’s newly-built Dreamland park. Billed as "The Tiger King," Henricksen obtained a huge success with his tiger act. The Morning Telegraph of June 10, 1906 was ecstatic: "Bostock’s Arena, Coney Island, has a matinée idol. He is the fearless Henricksen, who so gaily risks his life not only at the regular performances of his group of snarling tigers, but a number of extra times every day when he goes into the arena alone with the untamed Tammany, the fiercest and largest Bengal tiger that has ever been in captivity. Henricksen is a simple-hearted and almost boyish individual, and the honors of being much courted and sought after rest lightly on him." Henricksen had become a true showman, loved and admired by his audiences, and he lived up to his dompteur (tamer) reputation. His style, however, didn’t please everybody; in his memoirs, the Swedish circus owner Henning Orlando, who had hired him in 1908 for a Scandinavian tour, said that he found Henricksen, who, in a cowboy costume, stressed his animals with blank pistol shots and an iron fork, "too theatrical." Nonetheless, Henricksen admittedly managed to fill the house every night in practically all the circuses where he worked in Europe and Russia. In Spain and Portugal, he appeared before the royal families and received medals and gifts. A costly embroidered matador costume presented to him by the Spanish King Alfonso XIII is still in his family’s possession. Seeing a dompteur (i.e. an animal "tamer") work with wild animals may appeal to the audience’s subconscious wish to see blood. In that respect Henricksen gave them full value for their money, creating much media exposure that attracted more spectators to see him. Over the years, Henricksen filled several scrapbooks chronicling his career. One incidence alone filled one full book: "The Great Tiger Hunt" in Marseille. In 1909, he worked at Alfred and Jules Court’s Circus Egelton in Marseille, France. On September 25th, while the animals of a menagerie were loaded into a ship, one scared horse kicked open a tiger cage wagon. A three-year-old female tiger, Imperia, captured in Sumatra the year before, escaped; she wounded one person and killed a dog, before going into hiding between the big stone blocks that supported the quay. A regiment of infantry, whose soldiers were armed with guns, was called to the rescue. Unable to locate the animal, they and the Marseille Police closed the perimeter. Imperia kept quiet during the day, but roared, looking for food at night. This created an atmosphere of fear in the city and paralyzed the harbor—while generating newspaper headlines. The Police was not keen to search—and eventually confront—the hungry and dangerous animal. They finally went to Henricksen and asked him for help. Armed with a gun, Henricksen placed straw between the quay’s stone blocks, and put it afire. This smoked the tiger out: Imperia was immediately shot to the head and killed. Henricksen was then celebrated as a hero by the population of Marseille, and even received a medal and a diploma for his Acte de courage et de dévouement (act of courage and dedication) from the French Government. Sadly, it was an age when wild animals were called "beasts" and, much too often, trainers’ histrionics stressed more their apparent courage in the face of danger than an understanding and appreciation of their charges (which they actually had for the most part). Consequently, these "beasts" were by and large perceived by laymen as lethal threats to humans, and in case of danger, had to be immediately done with. Nowadays, the animal would have been subdued with an anesthetic dart. Henricksen’s pre-WWI career took him to such European venues as Circus Busch in Berlin, Circus Ciniselli in St. Petersburg, Russia, several German varieté(German, from the French: ''variété'') A German variety show whose acts are mostly circus acts, performed in a cabaret atmosphere. Very popular in Germany before WWII, Varieté shows have experienced a renaissance since the 1980s. theaters (at a time when German varieté(German, from the French: ''variété'') A German variety show whose acts are mostly circus acts, performed in a cabaret atmosphere. Very popular in Germany before WWII, Varieté shows have experienced a renaissance since the 1980s., a mixture of circus and variety theater, was all the rage), Circus Albert Schumann, Cirkus Orlando in Sweden, Cirkus Norbeck and Cirkus Globus in Norway, and Cirkus Miehe in Denmark, among others. At the outbreak of WWI, Henricksen, fearing a shortage of food for his tigers in Germany, took refuge in Norway. The following years he toured mostly with Scandinavian circuses: Cirkus Empress in Norway, Cirkus Hoffmann and Circus Smädicke in Sweden, Cirkus Miehe in Denmark, among others. His last tour was in 1923 with the Swedish circus Schreiber. A circus star and headliner for many years, Henricksen had been a highly paid performer, but he lost most of his earnings during the Postwar’s currency collapse in Germany. Time had come for him to retire, and he accepted an offer of 100,000 Swedish crowns for his tigers from Ringling Bros. and Barnum & Bailey Circus in the United States. 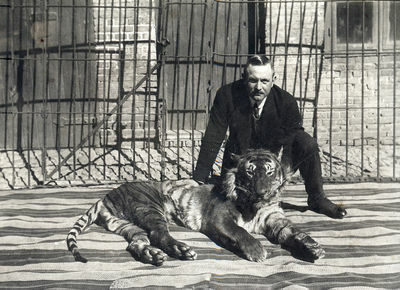 In January 1924, he travelled to America to deliver his tigers. He cried like a child when the moment came to part with his four-legged friends and he patted them farewell. In order to get his money safely back home he signed on as a galley boy on a ship for his return home. The money, in large notes, were sown into his overall, and he literally sat on his fortune while peeling potatoes across the Atlantic. Back home, he had to ask his bank for help, as it turned out that many bills had stuck together under the pressure of his weight. On May 24 of the same year, he returned to Oslo, Norway with his Norwegian wife and his two- year-old daughter and obtained Norwegian citizenship. He made good investments in real estate and spent the rest of his life living comfortably by the Oslo fjord and indulging his love of fishing on his small boat. He quietly passed away in his home on June 13, 1952, while reading a newspaper. Quite a peaceful exit for a man whose life had been filled with adventures, drama and danger.